Hello. Welcome to my Goalie Hotties page. This site is for all of the goalies--my fave players on any hockey team--who I think are Hotties. They may not have the best GAA or Save %, but that really doesn't matter to me. What I look for in a Hottie Goalie is looks. So, call me superficial. What can I say, I am a woman! But that doesn't mean that I don't know what hockey is all about! This site is under some major construction. Please bear with me here! If there is any Hottie goalie that you feel has been left off this site, plaese fill out my guesbook and let me know. I will take all requestes into consideration. 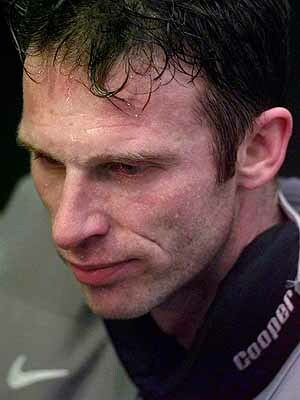 Here is my #1 Hottie of them all: Dominik Hasek, of the Buffalo Sabres! They don't call him "The Dominator" for nothing!